When BP’s Deepwater Horizon drilling rig exploded in April 2010, an estimated 172 million gallons of oil poured into the Gulf of Mexico, creating the worst petroleum-industry spill in US history. The stories and images of crude oil reaching the coastlines of the Gulf States were appalling — pelicans mired in grease, local fishermen devastated, ocean water slick with oil, ecological systems threatened. But that mess is fixed now, all cleaned up by BP. The oceans are clear. Swimming is safe. And we can all happily gobble down as much Louisiana gumbo as we desire. So much data refutes BP’s propaganda that Ballengée has made available, on the Ronald Feldman Gallery website, a 435-page appendix to Committed — yes, 435 pages — of all the information he has accumulated. 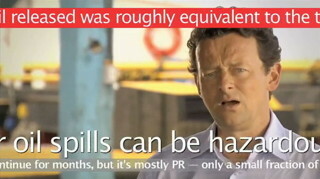 He also uploaded the Committed videos to YouTube, in order to disseminate his response to BP’s flooding of our screens and imaginations with misinformation, but the videos mysteriously disappeared without explanation. This act of silent censorship shows how environmental exploitation extends into other spaces not usually thought of as ecological. BP’s private degradation of land redoubles with the private cooptation of public discourse. Since the Committed videos violate the rules of many video-hosting sites, Ballengée and I (we met when we spoke together on a panel at Cornell University a few years ago) arranged to have them hosted on a mutual friend’s personal site: http://restlessculture.net/video/. They are fascinating to watch. This rebuttal effect should happen with all advertisements! Listening to the claims of BP authorities claims while reading Ballengée’s continual rebuttals makes it clear that there is a battle going on between the visible and the invisible, between what BP wants to hide at the bottom of the ocean and what activists, artists and scientists need to bring to the surface. Environmental problems are usually problems of invisibility; it’s often impossible to perceive the effects of toxic chemicals, the slight seasonal shifts caused by climate change or the ways in which fracking upstate affects New York City water. Many eco-artists begin their work by inventing ways to visualize industrial causes and their ecological effects. Ballengée’s Dedicated, a series of images collected from Gulf Coast residents and presented on a screen in slide-show fashion, demonstrates that science is not the only way to make these connections. Everyday stories from nonexperts can form a sort of database of collective evidence. Contributions to Dedicated depict the consequences of BP’s fateful decision to “disperse” the spilled oil with Corexit, a chemical that has not been approved for widespread use, let alone for mixing into the ocean. To get rid of the visible problem, the oil, BP released two million gallons of a possibly even worse, though invisible, chemical into the Gulf Coast. The Dedicated collection includes everything from local artists’ paintings to photographs of genetic abnormalities in wildlife and disturbing encounters in everyday life — all from the people who live in places effected by the spill and the Corexit used to disperse it, and who are seeing their environment dying around them. The most poignant image for me was a photo of children jumping in waves while dolphins lay dead nearby in the sand, most likely poisoned by the dispersant chemicals. The picture raised a question that has always preoccupied me: How have the connections between humans, wildlife and the environment become so unthinkable? For too many people, it is impossible to imagine that the now clean-looking beaches are actually deadly, that what killed the dolphin could also harm human children. 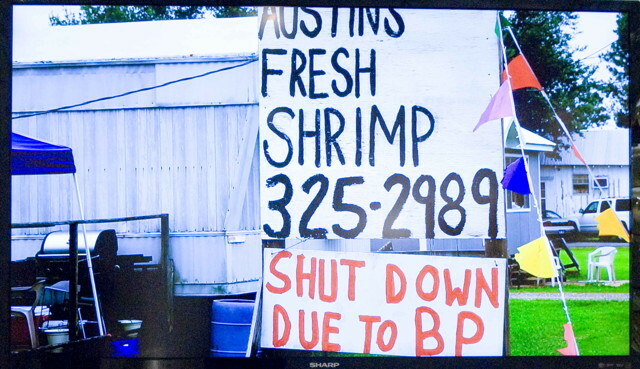 Stories like these and the images in the exhibition are, again, just a snapshot of another large appendix of data accumulated by Ballengée about the long-term effects of Corexit on the Gulf Coast, also available for download from the Ronald Feldman Gallery website. 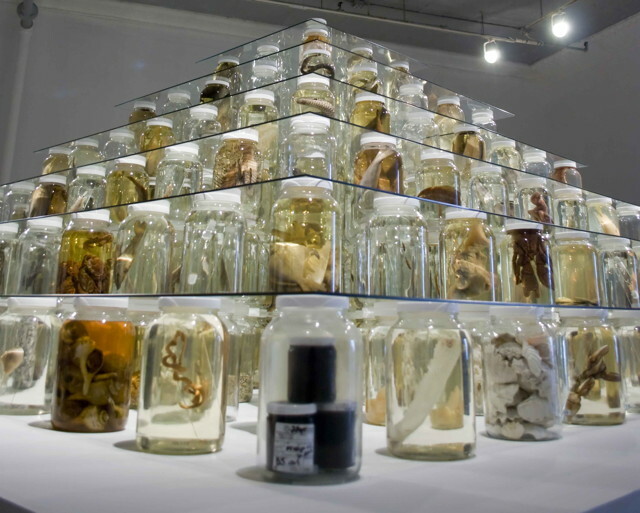 Much of Ballengée’s art is about uncovering the trail of invisible evidence about the state of our environment, whether it was concealed deliberately by BP or is simply undetectable because nature often works in ways not perceivable to the naked eye. 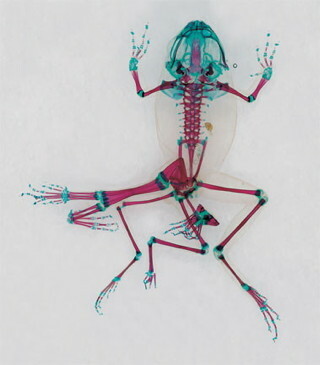 The ongoing project Malamp Reliquaries displays a series of chromogenic prints of terminally deformed, cleared and stained frogs. Their deformities are caused by trematodes, naturally occurring parasites whose numbers have increased because of a string of anthropogenic environmental changes. From his research, Ballengée understands the trematodes to be thriving due to the excess nutrients of fertilizers, which spur algae growth, which in turn supports an increased population of aquatic snails. The snails act as hosts to the parasites, creating an abundant habitat for the out-of-control growth of the trematodes ailing frog and toad populations. According to Ballengée, recent evidence also suggests that the immune systems of tadpoles may be compromised in some way, making them unable to fight the parasites. The tiny frogs in Malamp Reliquaries are our way into this nearly invisible chain of events. They are the observable symptoms of ecological systems at risk, a small clue to the worldwide disease of ecological destruction. Ballengée explained to me that timing is crucial: He collects the specimens during the brief period when tadpoles leave water and head for shore. That is when you are able to find all the young frogs too crippled to move on land. The prints are individual — there are no series — so every frog remains unique, a relic left behind. Ballengée names each frog and scans it on a background of cotton, which he said creates the effect of clouds. The sight is ethereal; the portraits form a collective obituary, a goodbye. A friend and fellow eco-artist visited Collapse with me, and after talking with Ballengée, we both left Ronald Feldman Gallery preoccupied with the aesthetics of portraying what can only be called environmental horrors. Eco-artists are often faced with a difficult situation: they must portray upsetting material without alienating their audiences, invoke ecological sympathies without scaring anyone off. Ballengée’s decision to print his thumbnail-sized frogs at about the size of a human toddler reflects his awareness of this dilemma. Any bigger, he said, and the frogs appear monstrous, inspiring fear; any smaller and they become dismissible. The size of a young child, he hopes, will inspire compassion in viewers. Perhaps, then, seemingly little aesthetic decisions can make big statements, and the collapse won’t happen without anyone noticing the invisible signs. Collapse: The Cry of Silent Forms runs at Ronald Feldman Gallery (31 Mercer Street, Soho, Manhattan) through July 31.